Luxury holidays come in many different styles. From serene beach holidays with sparkling shores and glittering white sands, to opulent city breaks in five-star hotels and days spent riding the Orient Express, not to mention ski holidays in world-class resorts and private island retreats. Oh, the list of unforgettable holiday experiences goes on! One destination that never fails to impress is Dubai, and as luxury holidays go, it's fair to say that this impressive location certainly knows how it's done. 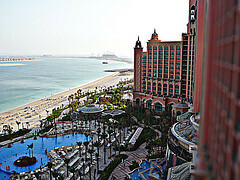 Dubai luxury holidays are nothing short of spectacular. After all, it's home to the simply impeccable Burj Al Arab, confidently billed as "the world's most luxurious hotel", so you know you'll be in good hands here. Head a little further along the coast and you'll come to the One & Only Royal Mirage, a sublime residence at the gateway to the Palm Jumeira. The Royal Mirage Arabian Court with Elegant Resort is the epitome of luxury. Everything about this incredible place sings elegance and opulence - from its striking architecture and sparkling fountains, to its beautiful landscaped gardens, courtyards and galleries. It has its own private beach and many rooms have balconies or terraces overlooking the grounds or out to sea. Inside, the One & Only Royal Mirage is adorned with warm colours and bold hues, graced by beautiful furnishings and bright airy spaces. Enjoy a relaxing spa session or take on a round of golf at the world-famous Emirates and Montgomerie Golf Clubs. Ask your host for help organising transport and travel to explore the area, head off for a day's retail therapy, visit the many impressive landmarks of Dubai, or simply flake out on the beautiful beach. This is what Dubai luxury holidays are all about. Dive in, indulge, and create incredible memories that will live with you for a lifetime. Last updated by jack on 16 December, 2013 in Travel.